UPDATE: Retailer also joins Outdoor Industries Women's Coalition. CHAPEL HILL, N.C. (BRAIN) — Performance Bicycle is expanding to South Carolina with the opening of its first store in the state at the Gallery Shopping Center in Greenville. Set to open in late spring or early summer, the new location will increase Performance's national network to 106 stores. 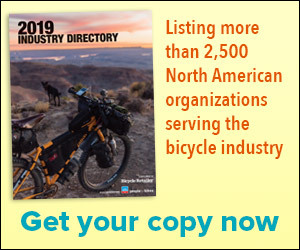 BOULDER, Colo. (BRAIN) — Membership at the International Mountain Bicycling Association hit a record high of almost 42,000 in February, up 15 percent from a year earlier. With the exception of June 2015, IMBA has had 31 consecutive months of record membership, the association reported. BLOOMINGTON, Minn. (BRAIN) — The QBP Fund — Quality Bicycle Products’ $1 million charitable trust benefiting bicycle advocacy, projects and organizations — has earmarked $50,000 for programs in Nevada and other states where QBP has operations. 20Collective says a 'Got Milk" for cycling could boost participation — and sales at all levels of the industry. SAN JOSE, Calif. — A group of retailers dubbed the 20Collective has launched an initiative to grow cycling participation by establishing an industry-funded “Got Milk”-style marketing campaign for cycling targeted at the general public. SACRAMENTO, Calif. (BRAIN) — The California Bicycle Coalition is seeking $10 million in state funding for what would be a groundbreaking program: giving consumers rebates for buying bikes. Registration also open for Ogden Fat Bike Summit to be held next week. BLOOMINGTON, Minn. (BRAIN) — Quality Bicycle Products has announced that its Northeast Fat Bike Summit will be held March 4 as part of the Winterbike event in East Burke, Vermont. But advocacy group reaffirms that it will not support amending the Wilderness Act as a means for expanding mountain bike access. BOULDER, Colo. (BRAIN) — The International Mountain Bicycling Association will pursue “a more assertive stance” on the designation of public lands as federally protected Wilderness areas that don’t allow bikes, it announced Thursday, but will not back any effort to amend the Wilderness Act of 1964 to expand trail access, as proposed by fellow advocacy group the Sustainable Trails Coalition. IRVINE, Calif. (BRAIN) — When Andy Lightle's wife asked him what he wanted for his birthday eight years ago, he couldn't think of anything he really needed. BOULDER, Colo. (BRAIN) — The International Mountain Bicycling Association is developing a mobile app for its volunteers and volunteer coordinators, working with unself, a company that develops similar apps for a variety of community organizations. BOSTON (BRAIN) — On March 1 the Massachusetts Bicycle Coalition will move to a shared work space in Boston, and the organization is inviting other related organizations to set up there, as well. ST. PAUL, Minn. (BRAIN) — Park Tool is announcing the winners of its Community Tool Grant Program, which provides community non-profits with more than $1,400 worth of Park Tool products, including a repair stand, tools and Park's bicycle repair book. BOULDER, Colo. (BRAIN) — PeopleForBikes has announced the recipients of its most recent cycle of Community Grants, with eight awards totaling $51,750.